Liberals have made it corporations’ responsibility to enforce content limits on public speech by leveraging their power into advertisers and as platforms. As advertisers, companies are now expected to guarantee they won’t finance speech liberals deem outside of acceptable discourse. In practice, this means blacklisting right-of-center voices ruled to have crossed the line. Liberal activist groups sought to cut off financial revenue streams to conservative and right-of-center voices — like Fox News host Sean Hannity and Breitbart News — by pressuring advertisers into boycotting them over perceived offensive statements. Left-wing group Media Matters has been waging boycott wars against Fox News for years. Media Matters led a successful boycott campaign to defund Fox News host Bill O’Reilly in April 2017, following a series of sexual harassment accusations against the longtime host. Fox News fired O’Reilly after his advertisers fled the show in droves. Similar advertiser boycotts in the past targeted conservative radio host Rush Limbaugh and then-Fox News host Glenn Beck, among others. Trump’s shocking victory in 2016 energized the left and led to a new round of boycotts. One group, Sleeping Giants, formed as a direct response to Trump’s election. 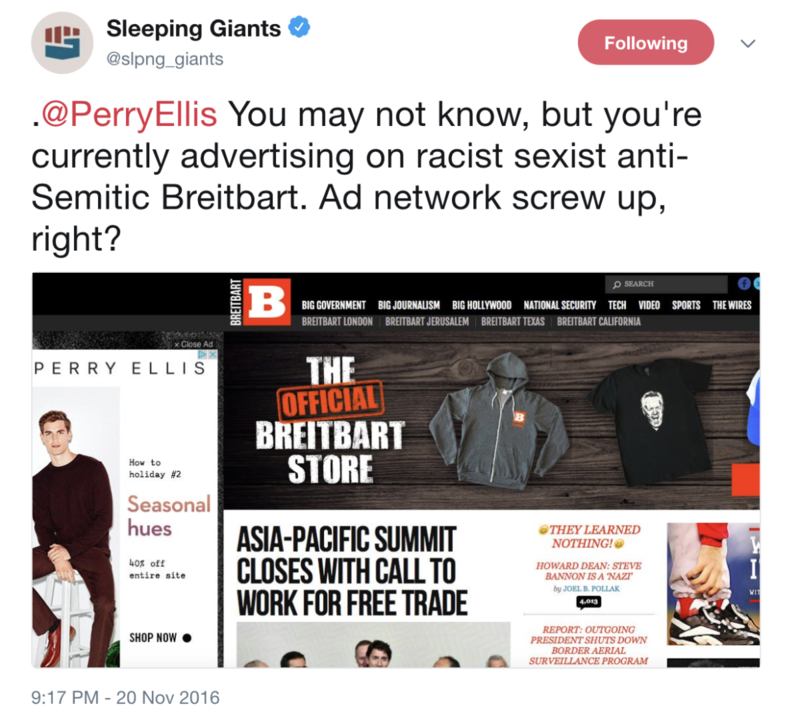 Sleeping Giants targeted Breitbart News’ advertisers in 2017 with overwhelming success: 90 percent of advertisers fled Breitbart in just two months and Breitbart continued bleeding advertisers since then. Under fire from the left, digital advertisers in turn pressured tech companies to get ahead of the problem by weeding out potentially controversial topics and voices from the advertising pool. Major brands pulled millions of dollars in advertisements from Google and YouTube in March 2017 after media investigations found ads running alongside extremist content. Google promptly revamped its advertising system to give advertisers more control, but the pressure hasn’t stopped. Just this March, Unilever, one of the world’s largest advertisers, threatened to pull ads from Facebook and Google unless the two entities better regulate content on their platforms. Unilever won’t invest in “platforms or environments that do not protect our children or which create division in society, and promote anger or hate,” chief marketing officer Keith Weed warned. Both Facebook and Google faced credible accusations of liberal bias even before their recent algorithm changes. YouTube’s recent demonetization push was meant to accommodate advertisers seeking to avoid controversial content, a Google spokesperson told TheDC. Liberal activists and politicians have also directly pressured tech giants to increase content regulations in order to combat misinformation and Russian propaganda and “fake news” — a phrase some liberals have tried to apply to conservative media outlets. The tech giants have implemented a series of internal changes in response to the outside pressure. YouTube nearly doubled the size of its “Trusted Flagger” program last year, adding 50 government agencies and non-governmental organizations (NGOs) to the program, YouTube public policy director Juniper Downs told a Senate committee in January. YouTube empowers the third-party organizations — “Trusted Flaggers” — to help police content on the platform by mass flagging content and working closely with engineers who design YouTube’s algorithms. The vast majority of YouTube’s “Trusted Flaggers” remain unknown to the public, hidden behind confidentiality agreements. Downs outlined to the Senate committee some of the other steps YouTube took to suppress inflammatory content. “Some borderline videos, such as those containing inflammatory religious or supremacist content without a direct call to violence or a primary purpose of inciting hatred, may not cross these lines for removal. But we understand that these videos may be offensive to many and have developed a new treatment for them,” Downs said. Facebook CEO Mark Zuckerberg introduced two new algorithm changes with far-reaching consequences in January 2018. First, Facebook slashed news articles’ share of the newsfeed from five percent to four percent. Second, Facebook began boosting certain “trusted” news outlets and suppressing other, ostensibly less trustworthy sources. Together, the changes boosted a “trusted” minority of news outlets while suppressing their competitors. Facebook now has a “point of view” toward the news as a result of the algorithm changes, Facebook executive Campbell Brown said at a tech conference in February. Brown is a former NBC News and CNN anchor who Facebook tapped to lead their news partnerships division in January 2017. Facebook has no plans to identify which publishers it’s boosting and which ones it’s suppressing, a company spokesperson told TheDCNF. Conservatives and Christians across YouTube have repeatedly seen their videos and channels demonetized or censored, especially within the last year. Conservative media company PragerU sued Google in October 2017 for repeatedly demonetizing their educational videos and placing them in “restricted” mode, but a federal judge dismissed the case on March 26, noting Google’s status as a private company. Google’s fact-check operation smeared conservative websites by falsely attributing inaccurate statements to them, a Daily Caller News Foundation investigation revealed. The fact-check targeted conservative websites almost exclusively. Google canceled the program just three months after launching it, following a backlash in response to TheDCNF’s investigation. Conservative website Western Journalism reached the same conclusion in a similar March 13 data report. Conservative websites saw a significant drop in traffic from Facebook following the algorithm change, while comparable liberal sources saw a slight increase, the report found. “There are examples of declines across the political spectrum,” a Facebook spokesperson told TheDCNF but declined to publicly name any of the trusted or distrusted publishers, arguing that releasing the data would provide an incomplete picture of Facebook’s newsfeed.